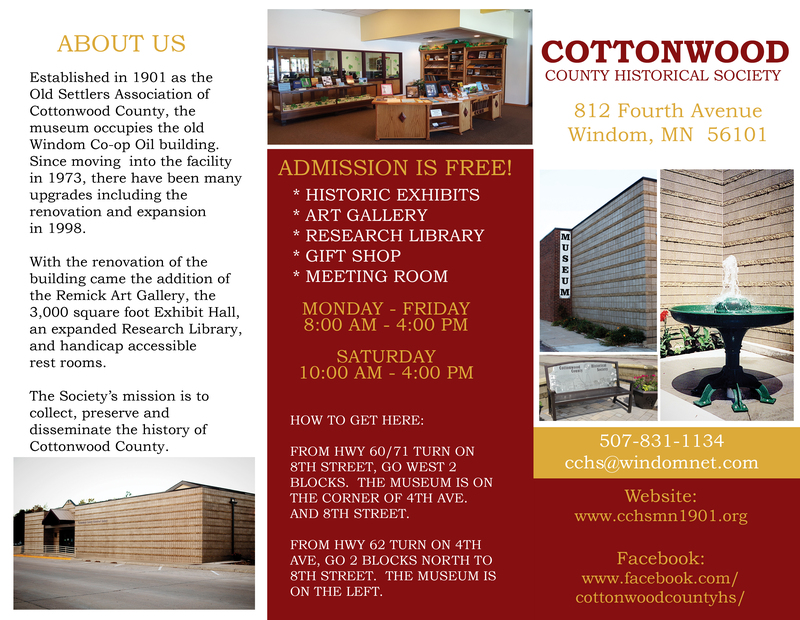 Established in 1901 as the old settlers association of Cottonwood County, the Cottonwood County Historical Society has occupied the old Co-Op Oil Association building since 1973 and was newly renovated in 1998. With the renovation of th building came the addition of the Remick Art Gallery, the 3,000 square foot Exhibit Hall, the expanded Research Library and handicap accessible rest rooms. The Remick Gallery is a changing art gallery showcasing local and regional artist along with thematic shows. We have three major exhibits a year along with the Cottonwood County Student Art Show in April and the Festival of Trees in December. Each show brings a new audience as the mediums change from acrylics to pen and ink to pastels. 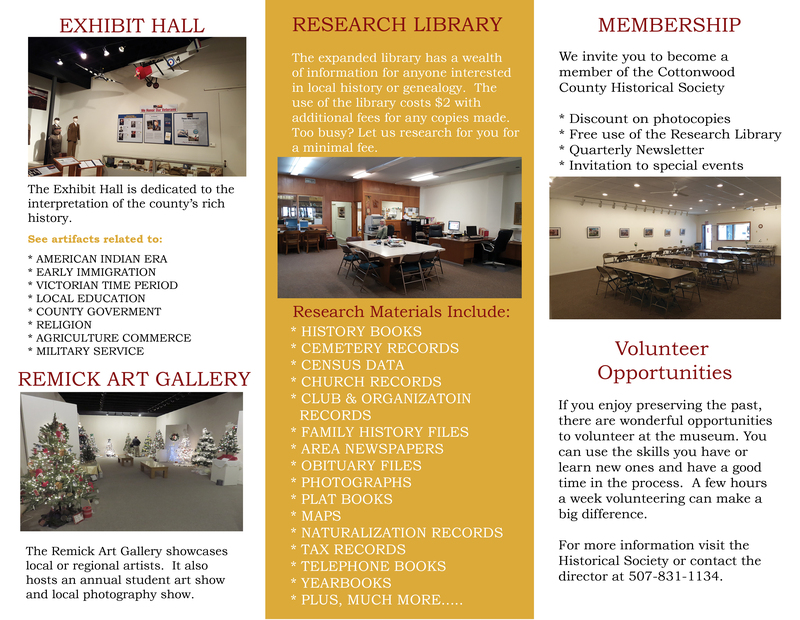 The Exhibit Hall is dedicated to telling the story of the county's rich history from the American Indian prescence to life in the 1940's. The introduction in the gallery gives vistors an opportunity to learn about the towns and villages of the county and the places of interest through in interactive map of the county. See artifacts of the Plains Indian before visiting an immigrant cabin of Scandinavian hertiage. Contrast their lifestyle to the English Yankee farmer's Victorian Parlor of the 1890s. Check out the history of our 1904 Courthouse and county law enforcement. Then go to the head of the class to reminisce about education in a one room country school. Enjoy the contrast of an early 1940s kitchen before and after electricity to see the effects the coming of electricity had on woment's work in the kitchen. Then stop by the General Store/Post Office to see the wide assortment of goods offered in a country store. The last exhibit showcases the typical farm workshop where farmers repaired their tools and equipments. Front Entry: A small case highlights a number of items donated to the museum collection in 2012. Take a look at our new brochure!